Benidorm has more than 100 local Real Estate agencies, so where you start finding the perfect property and which agencies you can trust and which you should avoid? Buying a property in Benidorm Spain of course starts with looking on the Interhomes Online Portal. On our website https://interhomesonline.com you can find a selection of the best local estate companies in Benidorm, Spain offering their Real Estate. Interhomes Online already selected for you the best agencies in Benidorm. No matter what type of property you are looking for to buy: buying an apartment in Benidorm, buying a penthouse in Benidorm, buying a villa in Benidorm, it all starts on Interhomes Online. The best local Real Estate companies in Spain will be always investing in the best marketing. The agencies you find on several portals are likewise most professional and most to trust. But Interhomes Online has a stronger selection than other portals. All our agencies have been pre-selected by our sales and account managers and checked on customer support, having up to date listings and fair prices. Ones they match our values we invite those agencies to advert their listings to our international clients. If not then we will not allow those companies to join our network. What to do in Benidorm and around? The first thing to do when looking for a bargain break is to choose somewhere where there really is lots on offer, competition means lower prices. The same rule applies to flights and accommodation. Exclusivity can be more expensive, but the best option is to place your drawing pin somewhere populated, and popular! On a budget, Benidorm makes for a smart choice, especially if you want to treat the whole family, it’s aimed at activities and family fun – you can’t go too far wrong. Flights are a-plenty, with lots of choice regarding flight times too – you needn’t necessarily land in the middle of the night, just to get a cheaper deal. If there’s no pool, then panic not, water-sports and water-parks are synonymous with the Costa Blanca, what are you still sitting there for? Pack your flippers and scuba mask – we’re off to Benidorm – and looking for 10 free things to do! Not just any old picnic. And certainly not with a Thermos of tea and two deck chairs next to the motorway – why do people do that?! 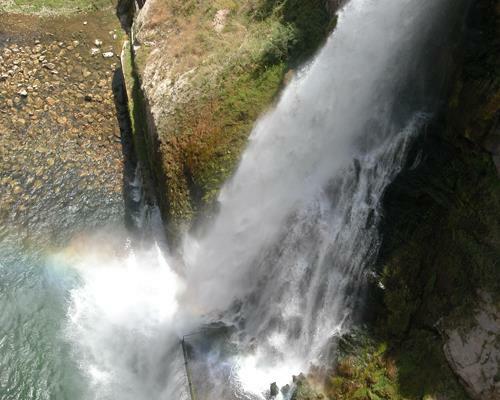 Pack up a couple of crusty barras de pan, some thinly cut jamón, and a selection of cold drinks and head for the Algar Waterfalls – just up the road from bustling Benidorm. What will you find? An oasis of peace. A tumbling waterfall, with designated picnic areas, and a river to splash and swim in. Just right for cooling off on a hot day. There are plenty of marked walks and trails here too – a perfect family day out. Okay, so you might want to spend some money when you get there. But the Old Town of Benidorm makes for a great stroll after dinner, made in your accommodation of course. Allow the kids to let off some steam as you explore the winding streets and cobbles of the Old Town, a stop for a cold drink won’t break the bank, and a bit of window shopping in the artisan outlets there costs nothing. Soak up the ambiance of the Old Town and admire the buildings and architecture – and remember the camera. A day out called for? Guadalest is your day out destination. Hewn right from the rocks that surround the place – there’s a Moorish castle to explore and an ancient bell tower. Just 25 kilometres inland from your holiday rental home in Benidorm, picturesque Guadalest will be a day out to remember. 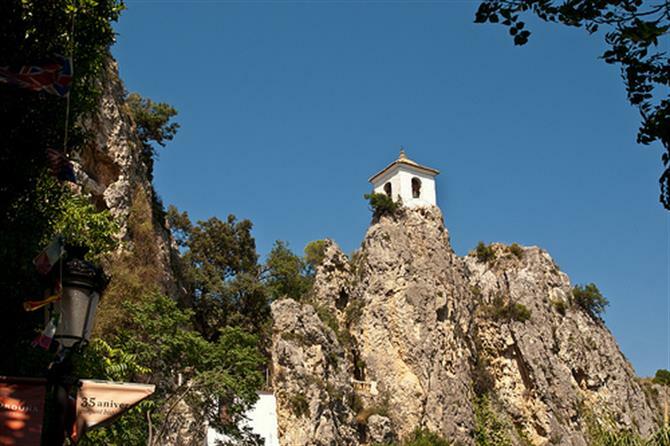 Just 200 residents inhabit this lovely place, but worth remembering is Guadalest is the most visited place in Spain – after the Prado museum in Madrid – so an early Spring visit might be preferable to one on a hot Saturday in August! Just saying…! Ah, the beaches. Probably one of the top reasons to visit the Costa Blanca, after all, it’s all in the name – the White Coast. Miles and miles of white sand, shelving waters – warm as a bath in Summer – and family friendly Blue Flag beaches to explore. There really is no better way to amuse kids than a few hours playing on the beach. Poniente is perfect, the requisite Blue flag, and a family orientated atmosphere await. 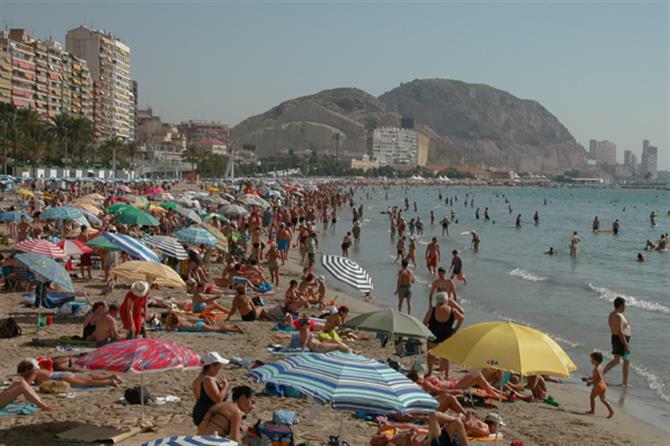 Levante is another good one, but more suited to a younger, singles crowd – teens and singles, enjoying a day out and mucking about near the water. Poniente would be for me – there’s only so long that I can breathe in for…. The Rock? 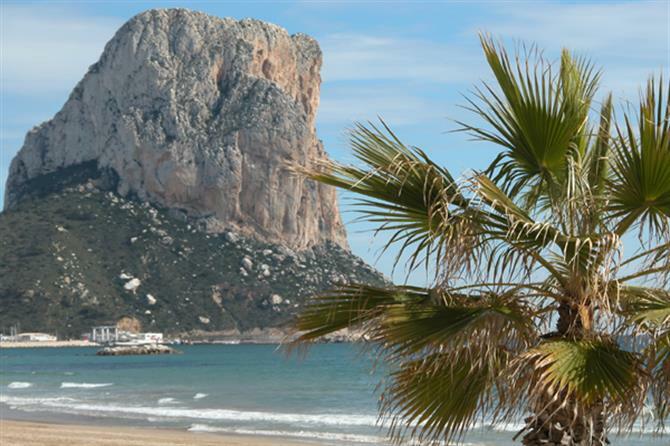 Yes, not Gibraltar but the Peñon de Ifach – I always think that sounds oddly Welsh – makes a great day out. Resembling the other, more famous rock, it juts up from the sea at nearby Calpe. You can really get back to nature here too – as the surrounding area has been designated a wildlife reserve. Calpe itself is not bad either. 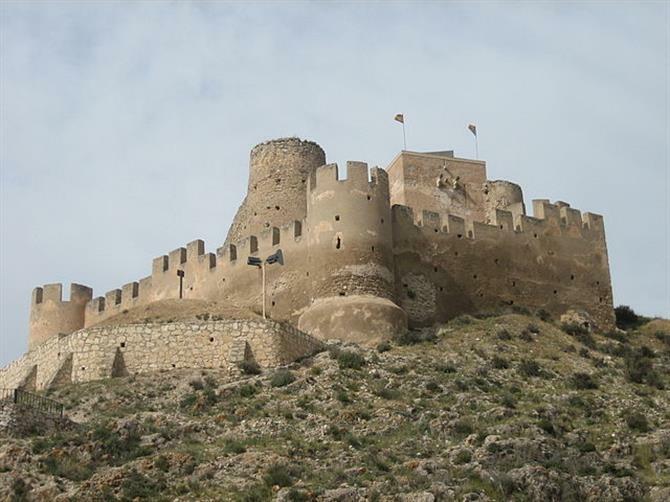 A 13th century military castle – Castillo de Biar – is also a national monument. it overlooks the town of the same name. A pretty dramatic day out, the castle stands in a lofty position, the views are amazing. A stomach lurching tall tower, the Tower of Homage, fortified walls and an enviable position, a trip to Castillo de Biar will make a great day of make believe for any child in your family! The bustle of Benidorm is fabulous, but you might find that after a week you also want to experience somewhere more local, traditional, quieter. No problem. 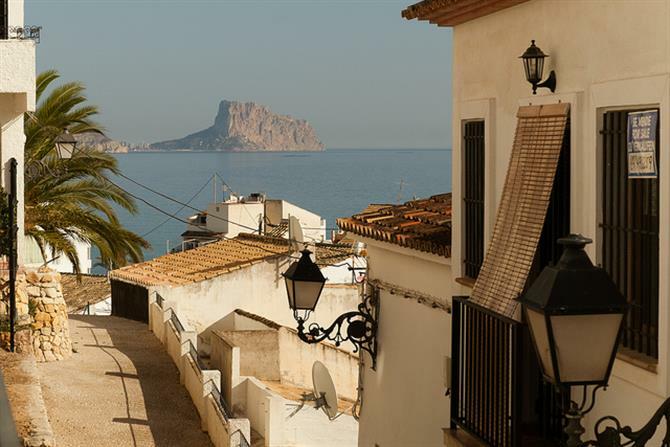 Right outside Benidorm lies Altea, the antidote to Benidorm, an oasis of calm and a perfect spot for a day of unwinding and seeing the other side of Costa Blanca life. A super destination for couples, it’s quiet, romantic, flower filled and as pretty as the picture it paints. You may find that you don’t want to leave, if so, stay another few days and try a two centre holiday – here are some choice places to anchor down in Altea. Of course, the best way to experience a FREE party – come to Benidorm when one of the fiestas is taking place. When is the best time? You’ll find various fiesta days, festivals and Saint’s days all year round – but November is when you’ll find Benidorm in full party mode. This is traditionally when fiesta week takes place, from the Friday of the second week. If you want to experience Spanish party overload, then pack the paracetamol for that week. Processions, paella, and the biggest – and loudest – firework display to top it all off with a discernible bang. Yes, the Spanish ‘do’ loud very well indeed. Not just the fabulous Mediterranean Sea – although that’s good too, and also free – but some curative waters, a another great day out without flashing the cash. The Fonts at Lion Mountain to be precise. What are they? Head for the base of Puig Camapana mountain – it resembles a sleeping lion, thus the nickname. You’ll find the wonderfully named village of Polop waiting for you, it’s all just half an hour from Benidorm. There 200 natural springs, and folk come from far and wide to drink the sulphuric curative waters, known to heal all ails – well, worth a try anyway! Back in the village square you can visit the former house of the artist Miro too – so one for the arty types with a health kick thrown in. One for me too – there’s a show factory outlet in town, with leather shoes at factory prices – now that’s what I call instant healing – or should I say heeling…? Of course, you’ll have to pay for those. 10 ways to enjoy beautiful Benidorm for FREE – what more could you possibly want? Just think, you’ll have saved so much money there’ll be enough left over for your next spanish holiday in the sun! InterHomes Online - why it is a unique property portal! ?